20Dear beloved audience, it’s a long time since my last post. I’m really sorry for that, I’ve been busy with a new job, but now I’m back. I would like to introduce you to some friends of mine, they’re Richard and Hannan, and their project is called Rainbow Collective. 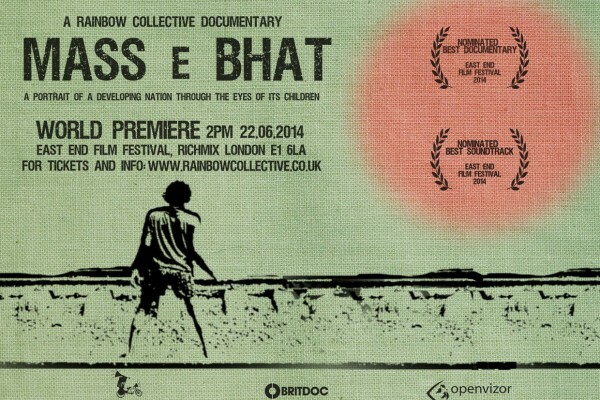 I’ve been impressed by their last film, Mass e Bhat, showing the life of street kids in Bangladesh, but not only for the content, in fact, instead of paying for the ticket, you had to bring unperishable food as a way to pay to watch the film. The food, then, is donated to another association, called Film for food (we will talk about that soon). I immediately felt they had a special project to share with us. Thanks to their braveness, now I’m aware that I can help someone in some parts of the world. 1) How was the experience in Bangladesh? Richard: My first time in Bangladesh was when we started filming Mass e Bhat, I’ve been shooting in other countries before such as Siria, South Africa, Jamaica, but I had completely different feelings. Bangladesh is quite a challenging area, it’s a poor area, but at the same time it’s a positive place, really safe, we got lost in the biggest slum in Dhaka, and we are still alive! We couldn’t go out in the evening in South Africa for example, ’cause it’s dangerous, we didn’t stop at the traffic light ’cause someone could come in and steal stuff from your car. Bangladesh is poorer than south Africa in term of GDP but you can move around with the equipment without feeling scared. It was an experience that changes my idea of Bangladesh, a unique one. Hannan: The experience was amazing, we had a great network and a positive response and we were allowed to film everywhere, being able to build our own reputation. 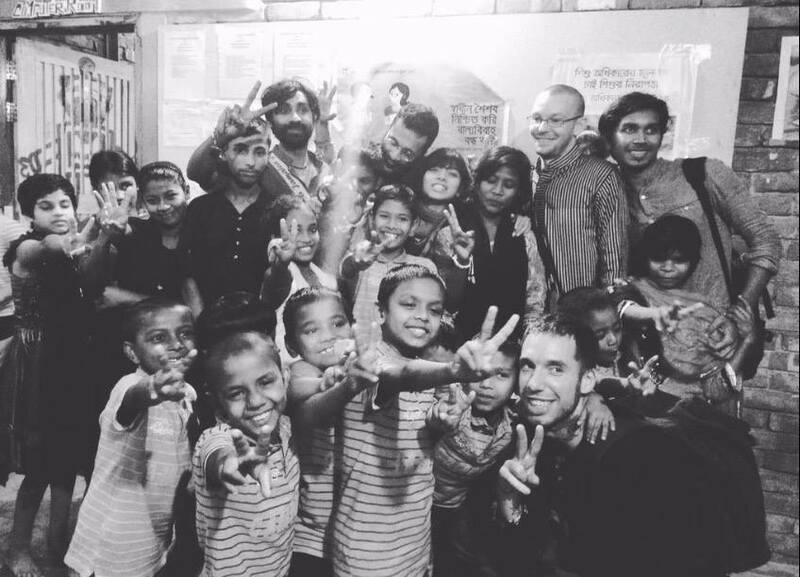 While shooting, we thought of helping the children we were working with, that’s how we came up with the idea of helping a generation of Bengali children to get into the film industry! We started a sort of training camp, with workshops and classes: we get them to express their thoughts and experience through films and animations, thinking about their own life, about their present and their future. They just needed to improve their skills and their confidence, as in Bangladesh it is very difficult to show up, sharing what you want to say or having a career in the creative industry. It has made a huge difference to them, ’cause they had been able to move to a permanent house and school, and we have become a shelter for them, encouraging them to gain the confidence they needed: in fact, now, they have their movies seen around the world! The children we were working with were mainly street children, kids who have to choose between domestic work or garment jobs. The majority of them can’t go to school, some of them attended temporary schools, one per week, where they learned basic English, math, literature and basic art. All of them have become examples for other street children, now. 2) Are you not scared? Meaning, if you are not following the rules, are you not afraid of the consequences? We actually found more resistance and reservation on suggesting different education models here in the UK than in other countries. The academic system in Bangladesh is not the same as in Britain, if you want to revolutionize art education here in the UK, you will find a wall in front of you, they don’t want to change it, ’cause 70% of people around the school are middle class, white, and we know what does it mean, historically. We are doing the same classes here in the UK, especially in Tower Hamlets or in South London, so we have local experience too! We are trying to show a different model, a more practical one. It’s really hard to do it, cause if you look at some other documentaries (90% fo them! ), the ones we’re used to watching, you can feel the emptiness, cause the crew doesn’t have any direct experience with the environment, they do it just for profit and that’s it. The film industry is not the moral anchor industry, journalism included, there’s so much exploitation. The Bengali community did not reject us, cause kids and adults were talking about something that they believe in, something personal, something that could change the life of somebody else for example. We teach art and even if we’ve been lead by children, we don’t investigate or report something to create a “case”, we are with them, helping them, being on their side. 3) What do you want to achieve with your project? Our project aims to produce films not only for profit. What we have done is not what usually directors do: making films, having great budgets, earn money out of the films, and then thinking about a new one. This is not what we have in our mind; we are doing these projects to create something new in the place we are doing it. This for us is the legacy, planting the seeds in the mind of the street kids or garment workers, trying to help them to improve their life. We are happy if a lot of people watch the films we produce, but it’s not only what we want. What we are looking for is an exchange, not just in terms of money. 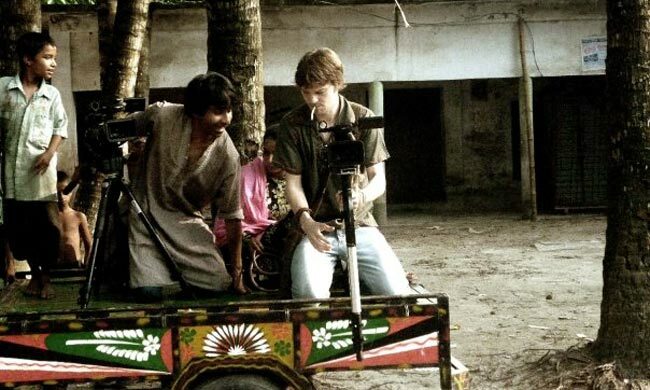 We have made the first two films in Bangladesh, then Al Jazeera got in touch with us (we didn’t work with them), they promised us a commission to shoot something similar in that area, with a potential of 25 millions of viewers. We knew we could do it, but originally we were looking for a different point of view, we didn’t want to spend our career to do just this kind of documentaries, ’cause they’re all seen by the same well educated and rich people. And I think the meaning is different, ’cause there’s just an artificial approach. We prefer a few people watching our films, but we want to do things that show and engage with people directly. 4) Could you give us some example of your legacy? Yes of course! The children we have been working with, have made a short film which was released last year, and all about their experience. They kind of directed and took part in the film themselves, and, as soon as they finished it, they showed it in galleries and museums in Bangladesh, cultural centers, and conferences. They represented their lives on the screen, talking directly to an audience, and it was a very good experience for them cause when you show your film your confidence is high, and they were able to talk with a wide range of people. Let me give you another example. We have curated a video project were garment workers interviewed lawyers or more experienced workers, in order to share information about workers rights. In Bangladesh there are many people who are not able to read properly, so sometimes they don’t know how to behave in specific situations. Watching videos simply using a smartphone is very powerful, as everyone would know how to behave or what his rights are. If your boss wants you to work more than 8 hours per day, you can just watch a youtube video that explains to you how you can behave or what your rights are. And that piece of advice isn’t coming from us, but directly from the workers community, so it’s even more powerful! We built a worker movement, something similar has grown in Cambodia and Turkey, they know what to stand up for and fight for, they might not know which are their rights, but with this system, you can be sack, or beaten or kept in prison. Even if they are still afraid of been unionized, they can still know their right. When we started shooting Mass e Bhat we contacted different charities and NGOs in Bangladesh, one of them, called BYNISA, recruits street kids and gives them the opportunities to study at their school. At that time, Nasir was one of them, he went through the process, he was working part-time while studying, and when we met him we immediately thought to involve him, for the too many stories combined together. He was amazing! We learned he moved from the village to the city (this is the main reason of children labour), once there his parents couldn’t find a job so he started working on the rubbish tips, then in a garment factory, then he came out that he had an education, and then he worked in Bynisa’s guesthouse. Having a relationship with the families was not a problem at all, we have been invited also in the slum, called Karail, where his parents were living, the largest one in Dhaka at that time. His house was nice and we went there almost every day when we were shooting: they were very committed to showing off his son, cause they thought that he could be an example for other kids. We were respectful, the film is respectful and also there are a lot of charities and NGOs over there, so people know how it works. People are not silly, they know what we were doing cause we also showed it directly to them, and they accepted us. We’ve been to some other villages too, everyone was very open minded and keep to highlight their issues, everyone was helpful, they wanted to come out with problems and solutions. 6) Are you still in contact with organizations over there? We are in touch with the kids we met while we were there, when we go back we always want to meet them, whenever it’s possible. We will always keep a relation, sometimes it’s hard not because of your willingness but because they move, they are street children, they change their phone and SIM card very often. Most of the people were living and working in the train station, and also when we finished shooting we wanted to meet them again but they weren’t there. For example, we made a film about the collapse of a garment factory, the Rana plaza building (where more than a thousand people died, NDR), and we interviewed a grandmother, that had to grow up two little kids, cause they lost they parents in the accident, they were really traumatized, and it was really tough to do. We remember some European journalists shooting documentaries about how and what they felt, but we wanted to do something different and trying to tell a story of a family. We’re still in contact with her, and when we come back we see the two boys grown and happy, and we realize they ended that traumatic period thanks to this woman and her work. Sometimes is frustrating to not being able to keep in contact with someone, but on the other hand, you are still in contact with someone you see has been able to improve his/her life. And we’re happy for that. 7) How is possible that someone is living like that? Why are we not able to do anything to help them? I think we can do something, but the problem for them is that they were born in an environment of poverty. We can do something, for sure, look at Nassir, he has a permanent job now, he’s married, he has kids, but he started from the bottom. They need to get out of the poverty, this is the main goal. And why is it like that? Cause there’s no access to education! For example, we’ve been to Jamaica, one of the best country I’ve ever seen: there’s great vegetation, amazing fruits and food and landscape too, but it’s quite a new island. It was inhabited since the British brought here their slaves, and probably the European imperialism has created everything you see. You see all the negative aspects of this country, cause their lives are tough, and we tried to take their anger (cause they live with violence and exploitation) and channel into something artistic, in a film. Bangladesh, South-Africa, Jamaica, all of those countries were under the British Empire, they fucked them up, and, for us, the goal was to instill confidence in themselves. Those kids are so much better than “our” kids, but only if we can get them the opportunity to access to study. Imagine, even with limited opportunities, they were doing great things. I had the privilege to study, I have access to NHS, I had two degrees, the Empire give me those opportunities, the same happens in France, Italy, Germany etc. We have skills, we can still learn, we can get qualifications and that’s why we need to share our knowledge with them: this our way to give them things back. There is online petitions or activism, it’s cool that people are engaged and marching. But, just being part or doing your activism, even if with other people, well we think it’s not enough: I think that everybody can do something better than anyone else, creatively, physically, personally etc, so everyone can use his best skills in order to improve the life of someone else, and take him to the next level. We use our talent for making films and try to pass to kids, through training projects, classes, workshops. We all can do something! We all can do something!